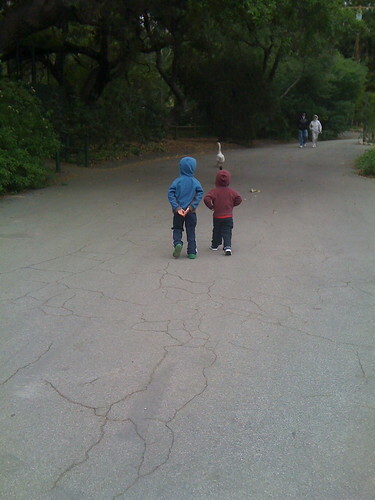 I took the boys to Descanso Gardens this morning, and braved the cold (Eek! 58 degrees!). We had walked up to see the ducks in their usual hang-out, but none were there. 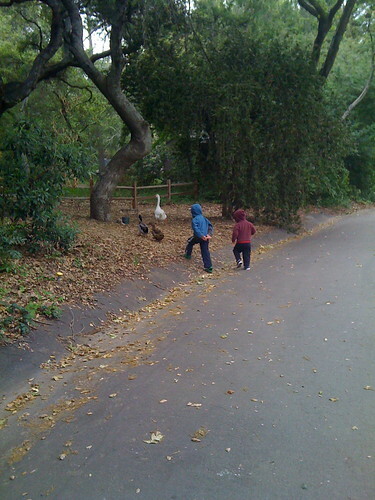 As we walked back along the road, we discovered a goose and two ducks wandering around. Then they formed a line — the goose first, then the ducks. Ezra and Finn couldn’t help but join in, and soon they were in line behind the animals, flapping their arms, Ezra shouting “Quack, quack!” and Finn shouting, “Cack, cack!” I only had my iPhone camera with me so I wasn’t quite fast enough to capture the best moment, but these pictures will have to suffice.